A few hours by bus from our last stop, Hoi An, and we were ready to tackle the next city on our route, Hue. This was Vietnam's former capital, and was the seat of power for the emperors of the Nguyen Dynasty, so there's plenty of history to discover here. I had heard that there wasn't all that much to do in Hue, so I was pleasantly surprised to realise there was ample amount of things to be doing in our couple of days here, though since I'm not much of a history buff, it was perhaps not my favourite destination on the trip. And after the beauty of Hoi An, being back in a crowded city, lacking that same picturesque quality, was a bit of a downer. There were still plenty of interesting and pretty sights to see once we started exploring though! We arrived in the early afternoon, and I didn't do much with the rest of the day, since I was in need of some relaxation after being so busy in Hoi An. I did go for a wander in the area around the hotel (mostly in search of coffee), which was the side of town closest to the Citadel. This was convenient for visiting the Citadel of course (which I did on the last morning), but most of the tourist and backpacker hotels, restaurants, bars and such are on the other side of the river, so it was quieter where we were. The streets I wandered through were mostly small shops, with the motorbikes by the dozen racing through the streets, as they do throughout the whole country. The evening was a highlight of the whole trip though, as we went to have dinner at the home of a local family. The taxis dropped us off on a street corner, and from there we followed our tour leader through a maze of narrow alleyways, where most homes had open doors, so we could see inside. This was clearly an area where the people do not make much money, as every home was very simple, and often shared by many people. The home we visited was that of a family of five, and they lived next door to their other relatives. The father works as a motorbike driver, and our tour leader had met him one time when she was here and he took her on a bike tour of the city. The mother is an excellent cook, but as they can't afford to open a restaurant, they gain a little extra income by hosting dinners such as the one we had there. We ate at a long table in the room that serves as the bedroom of the three sons most of the time, so they pack away the tables and replace them with mattresses. And the food was absolutely delicious, and probably some of the best I've had on this whole trip. We were given so much that we couldn't finish it all, though we tried our best. The best part was getting to interact with the family a bit, something I felt was missing from the Mekong Delta homestay. The eldest son is studying tourism at university, so he practiced some English with us; we also nicknamed him Vietnamese Freddie, as he was the same age and bore some resemblance to our Freddie (who then became "Non-Vietnamese Freddie" for the rest of the trip, and was often jokingly told to be more like this kid!). And the youngest son, and many of the cousins came out to give everyone high fives, show us card tricks and perform songs for us, all of which was very impressive and pretty cute. The youngest girl was ever so confident and sassy too, and reminded me a lot of a couple of my kindergarteners. All in all, an excellent meal and way to spend an evening. The next morning we were up early for a full day trip to some of the sights around Hue. This is one of the closest cities to the old DMZ region, though it was still over an hour and a half drive to get there. The line follows the Ben Hai river, and covers an area 5km to either side of it. We walked across a footbridge, which is painted in two colours, and the point where the colour changes marks the exact line between north and south Vietnam. Our local guide gave us a little information, and we visited the museum there, which has old artefacts and information about life in this region during the war. However, overall this was a somewhat underwhelming stop, since we drove so far to get there, and there really wasn't that much to see, or any remnants of the war times, other than those in the museum. 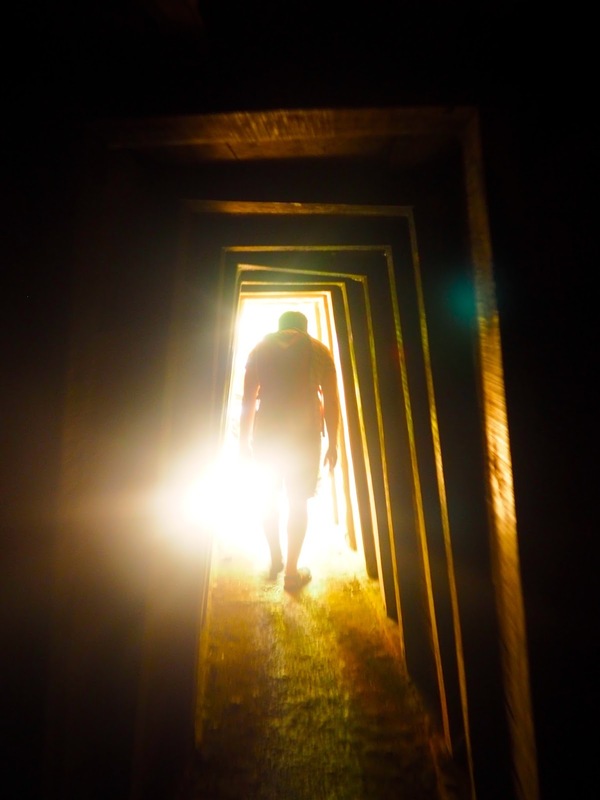 The next stop was more impressive though, as we travelled to the Vinh Moc tunnels, where hundreds of people lived underground for several years during the war. 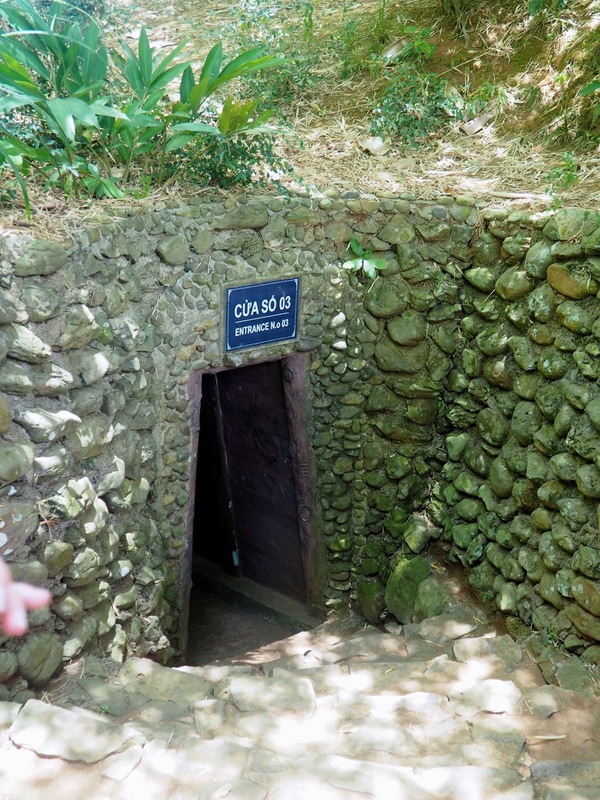 I missed out on the Cu Chi tunnels back in Ho Chi Minh City, so I was glad to get to see something similar; apparently the main difference was that you could actually stand up in these ones, which was a relief to hear! After watching a video about the tunnels, which was interesting though a bit long, the tunnel guide led us underground, where we edged our way through the dark, narrow maze. The tunnels were wide enough for us to walk single file, but most of us had to stoop for the low ceilings, and we wound up and down tight stairs and past small hollows where families lived. It was lit the whole way, but some parts were still pretty dark. We saw the meeting room, which was the only point where we could all breathe a little more and stand up straight, and followed the tunnels all the way down to their coastal entrances, right beside the ocean. It was incredible to think that so many people lived in there, and had to just get on with it, for their safety. After a quick lunch at a rest stop on the way back towards Hue, we visited Thien Mu pagoda, just outside the city. This pagoda is still an active monastery, and we caught glimpses of a few of them walking around, though the majority of the crowds were other tourists. The tower at the front of the complex is also the tallest religious building in Vietnam. We strolled leisurely through the complex, knees and shoulder covered as a mark of respect, and learned that the name of the pagoda means Heavenly Lady, because of a local story of an old lady who foretold the construction of a pagoda on the site. The bonsai garden was a nice touch to this pagoda, something a little different to the others I've seen on this trip, as well as the highly impressive tower. From there, we descended the stairs down towards the river bank, where we boarded a colourfully designed dragon boat, to cruise along the Perfume River in. The river is pretty wide, so it was hard to see much happening on the banks, but it was a nicely relaxing way to end a long, busy day. That evening, we went for dinner together to try Vietnamese style hotpot - like the barbecue back in Nha Trang, I've had hotpot in Asia, but this was a slightly different style to what I'm used to in Hong Kong. First we made our own spring rolls, taking the meat straight off the whole fish served to us. Then we had two hotpots between the table, one with chicken and the other with fish, with morning glory (a common local vegetable) and noodles to mix in too. Then we decided to go for some more drinks (after already drinking several very cheap beers with dinner), so our tour guide took us to a bar called Brown Eyes, where everyone seemed to know her! A few happy hour priced cocktails later and we were all up on that dance floor until late into the night. It was the most I've partied with this group in the whole trip (not counting the night with my other friend back in Hoi An). The next day was our last in Hue, and we had a few hours to explore a little more before boarding our final overnight train, which would take us to Hanoi, the last city of the trip. Since I hadn't visited the Imperial City when we first arrived, it was the logical choice for my final morning here. I've heard the Royal Tombs are also worth visiting, and in hindsight I would have perhaps chosen these instead of the DMZ, but it's almost impossible to see absolutely everything everywhere when travelling. Anyway, my roommate Freya was also visiting the citadel that day, but since I'm as far from a morning person as you can be, she was out the door before I even dragged myself out of bed, though I still had plenty of time to see it all before we had to leave Hue. It's a pretty massive complex though, and you could spend far longer here than the hour and a half I did, if you really wanted to learn everything about it, or perhaps take a guided tour, but I just roamed around myself, admiring the impressive structures. 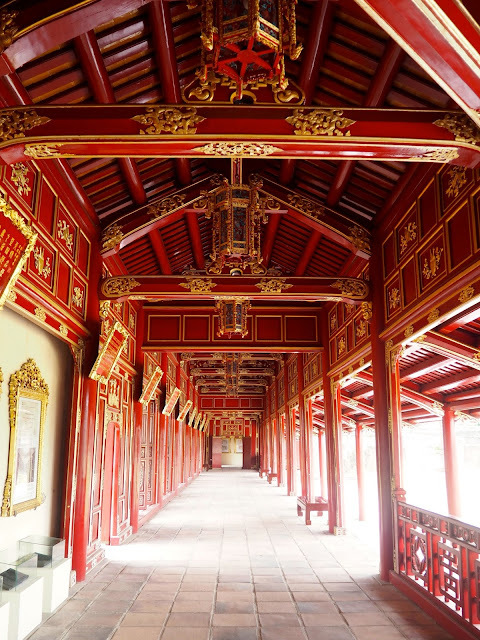 The Citadel was the home of the Vietnamese Emperors for many years, until their reign ended in the 1900s, and the buildings suffered a lot of damage during the Vietnam War, though some of it has been restored since then. Inside the walls of the fortress there are so many buildings, from the palace and residences to numerous temples, and the Royal Theatre, all built in the classical Eastern style, with perfect symmetry throughout. Many gates flank the citadel walls, with even more to be found inside, and all of it is interspersed with beautiful gardens, with bonsais, topiaries, statues and pavilions throughout. It would be easy to get lost in there, but I managed to stick to a basic circular route and get in and out without wasting much time. Back at the hotel, we all met up and went out for lunch, before boarding the last overnight train. This was the longest, taking about 13 hours to get from Hue to Hanoi, which was why we left earlier than the others. It was also my least favourite, largely due to cockroaches we found in our compartment... We made it out alive though, albeit very tired. All in all, Hue would be fascinating for people interested in that sort of history, be it the Imperial City and the tombs, or the war-era tunnels and DMZ further out of the city. Personally, I found the history interesting up to a point, but after a while I can't take in any more information. The rest of the city wasn't all that exciting either, and given the choice, I perhaps would not have stayed here for as long as we did; one day and night would have been sufficient I think. But not every place can be perfect, and Vietnam still had more to offer. Next stop, Hanoi!